Denver the Guilty Dog was born on the 4th of July and raised on the Eastern Shore of Maryland. She is your typical Labrador Retriever and loves swimming, fetching, rolling in everything, making her family happy and playing with her sister Masey, a Golden Retriever, and her two brother kittens, Pouncer and Clover. Her absolute favorite two things to do are playing in the creek behind the house and being an active member of our family! She is a very, very special dog with a unique personality that is well-loved and taken care of by her family. Everyone that meets Denver quickly realizes she truly has a personality unlike any animal they have ever seen. We knew Denver was special and on March 8, 2011 the whole world found out just how special she was too! Her “Guilty” video below is now at 44+ million views and is running at a viral rate of about 43,000+ hits per day…which equates to 1.1 million hits per month! 1. How did you know Denver was destined for fame? I remember waking up one day and receiving emails from all the major morning TV shows wanting me to bring Denver and appear live on the set. When that happened, I felt pretty confident that “Denver” was going to be a household name. It was truly an amazing feeling. 2. What do you think is the most important message to share with kids? Well, when I wrote Denver’s first book, Denver Crosses the Creek , I wanted to fill it with several message for kids while telling a great adventure story. Messages like trust, telling the truth, follow directions and to use caution when talking to strangers. I was able to input these messages throughout the story and all the characters in the story play a significant role in getting those messages across. 3. 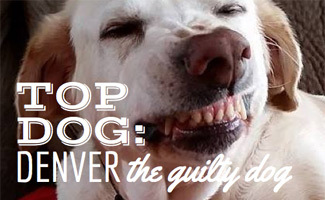 Can you explain what makes Denver so guilty? Denver seems to find her way into sticky situations… and quite regularly. To a fault, we innocently leave things around that seem to catch Denver’s attention. She has gotten into backpacks with leftover school lunches. She gets into the trash cans and helps herself to any food scraps or food packaging and her most famous stunt was knocking the kitty treats off of the shelf and tearing open the bag. Our biggest current challenge with Denver is keeping her off the couch! 4. What is the coolest show or event Denver has been a part of? Visiting children at schools for her book readings is by far the coolest events we attend. Sitting up on the stage or in front of the classroom and telling the story of Denver Crosses the Creek is priceless. I catch the kids smiling, whispering and winking at Denver and it’s so special to see. And the meet and greet afterwards is always so amazingly special! 5. What’s Denver’s best trick? Denver’s best trick is the ability to scuba dive. Yes, scuba dive! Denver LOVES the water and with the creek in the back yard she spends a lot of time in there. Our family will sit on the deck having lunch or dinner and Denver will go swimming all by herself. We laugh and giggle as she will literally dive under water and swim around underwater looking for sticks and things to grab and play with. We have that video on her YouTube channel. 6. What do you feel is Denver’s best feature and why? Denver’s best feature is her soft, playful affection towards others, dogs or humans. When visitors come to the house she goes and grabs a toy, walks a few circles around the person, then lays on her side pawing at them to come down and play. It’s quite amazing to see. 7. Who’s Denver’s favorite fellow celebrity dog? I think Denver’s favorite celebrity dog would be Scooby Doo. Scooby is a big character favorite for our children and we watch the old cartoons quite a bit. Often our family jokes at how much Denver reminds us of Scooby Doo and the fact that he likes treats and gets into sticky situations all the time. Definitely, Denver is a close second to Scooby Doo! 8. What’s your advice for other dogs looking to make a difference in the world? Find what makes people happy and keep giving it to them! 9. Is there anything else you’d like to share with our readers? When people come to our house they cannot get over how Denver will make the guilty face regularly. They all say they have never ever ever seen anything like it in their life. And one thing we never talk about is Denver and airplanes. We sometimes put her out on the deck and she will sit there staring up at the sky waiting for an airplane WAY up. When she spots one, she starts barking at it and looking into the house at us like, “Hey come out here, I see one!” LOL! Does your dog ever make a guilty face like Denver?